A few bright aerospace engineers at U.C. are doing a lot to test the sky’s limits. It wasn’t even as big as the palm of his hand, and the whir of its motor sounded like a pesky mosquito buzzing his ear. But never mind that this flying contraption looked like a Cracker Jack toy on steroids. Steady at his hand-held control, University of Cincinnati freshman pilot Kyle Wilson’s eyes were focused as he maneuvered his drone skyward—until it bumped violently into the ceiling. Then he brought it down slowly for a perfect landing on his backpack. His grin said it all: Really? I’m getting college credit for this? Welcome to drone class, or specifically AEEM 3077: UAVs for Urban Communities, where some of UC’s brightest underclassmen come face-to-face with the technology, the opportunities, and the unanswered questions of an emerging industry. First things first: nomenclature. Kelly Cohen, who heads UC’s drone research and development program, doesn’t actually call them “drones.” Those who know typically refer to them as UAVs—unmanned aerial vehicles, the common name in your average video game—or UASs—unmanned aerial systems, a more precise description of technology that can carry a lot of other devices and disciplines high into the sky. Cohen, a professor in the Department of Aerospace Engineering and Engineering Mechanics, was a program leader in an Israeli UAV initiative for 15 years before coming to the U.S. permanently in 2005 as a research contractor at the Air Force Academy in Colorado Springs. In 2007, he joined the faculty at UC. On a warm September morning in the engineering building, with the elevators and AC on the fritz, Cohen tosses his jacket aside, rips off his tie, and plunges enthusiastically into the world of fuzzy logic, intelligent systems, and multi-agent decision making. 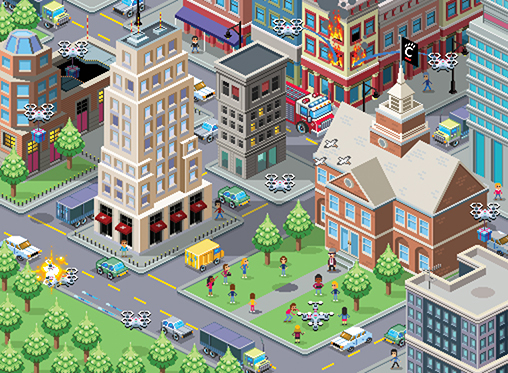 In Cohen’s future world, the UAV is decidedly not just a cool gadget flying through the air—it is a commercial delivery system, a cartographer, a police detective, a firefighter. Quite possibly a lifesaver, too, in part because it has a bit of what we might call a brain. The two men hit it off, hatching a plan over lunches and extended coffee breaks. (“We were on campus so it was coffee instead of beer,” says Kumar.) Ideas morphed into plans and plans developed into what is now a steadily growing academic research specialty. With encouragement from UC, Cohen and Kumar have grown their program with money from state and federal sources. Perhaps the best testament to UC’s expanding influence in drone research was a $500,000 competitive grant they won earlier this year from the National Science Foundation. The student population for the class is still small—about 20 in the post-graduate program and 10 undergrads—but they range from a curious sophomore enjoying a break from Homer and Shakespeare to master’s and doctoral candidates deep into research and design. And with Cohen and Kumar as their guides, they are charting a whole new scientific and ethical frontier. It was fitting that six years after the Colorado inferno that inspired his newfangled career, Cohen’s first venture into the non-military use of UAVs found him back on the fire line, this time through a partnership with the West Virginia Division of Forestry. With forest fires, UAVs—which can fly vertically and sometimes go where fixed-wing aircraft and helicopters can’t—are able to provide critical real-time data. Working with the National Aeronautics and Space Administration, the National Fire Science Foundation, and the West Virginia foresters, Cohen and Kumar are developing a set of protocols to fit specific algorithms with existing fire prediction models. “UAVs can add to these models what we don’t have now: real time information that will allow us to predict quickly where the fire is going and how fast, so we can allocate our resources accordingly,” Cohen says. Specially outfitted UAVs could assess wind speed and direction and analyze how a fire is growing; use cameras to see through dense smoke; analyze the abundance of combustible fuel on the ground; and protect firefighters by alerting them to changing conditions. Cohen is even more expressive. He labels these hobbyists “pirates” recklessly playing with “their toys,” endangering lives, and threatening the future of UAV technology application. He has a point. Hobbyist drones have dropped in uninvited at the U.S. Open tennis tournament, disrupted an air care flight in Dayton, crashed into the Great American Tower in downtown Cincinnati, and landed on the White House lawn. Then there’s the Kentucky man who shot a drone that was hovering over his house and his sun-bathing daughter. “There are rules for hobbyists but a lot of them are either unaware of them or they don’t care,” says Tom McMahon, vice president for advocacy and public affairs for the Association for Unmanned Vehicle Systems International (AUVSI), which lobbies for rules that they believe will unlock the commercial potential of drones. So far they haven’t had much luck. Back in 2012, Congress ordered the Federal Aviation Administration to establish rules by 2014 for drones weighing less than 55 pounds and to integrate all UASs into the national airspace by September 30 of this year. Both deadlines came and went with little more to show than a new rule requiring exempt drone operators to register with the Department of Transportation. The delay in finalizing a comprehensive UAV regulatory regime frustrates McMahon, who says the lack of rules has stunted the industry’s growth. “Right now, unless you get an exemption from the FAA, you can’t do anything commercially with a UAS,” he says. “You can’t make any money.” Exemptions have been granted but the process is slow and arduous. Operators, for example, have to have a sport pilot certificate and have cockpit experience. That narrows the field considerably. McMahon is cautiously optimistic that the new FAA rules—whenever they come—will require only that the operator pass a knowledge test but not need an actual license. His organization has advocated for regulations that would restrict a commercial UAS to daytime flying only up to 500 feet and at a safe distance away from airports and population centers, and require the operator to maintain line-of-sight control with the flying vehicle. With the appropriate rules and regs, AUVSI’s analysis shows that the economic impact on Ohio could lead to $2.1 billion and 2,700 jobs over the next 10 years; in Kentucky, it could be $537 million and 678 jobs. Martin Rucidlo plans to be ready for that day. His warehouse in a Loveland commerce park is abuzz when I stop by in late September. This is the home of the Horsefly, an eight-rotor UAS that one day may do what Santa has done for centuries: Drop your Christmas presents out of the sky and onto your front porch. It is an imposing machine. Weighing in at 15 pounds, it measures 57 inches across on its diagonal with a metal tray below its wingspan that can carry a 10-pound package. The eight black whirring propellers are capable of producing speeds of up to 50 miles per hour. It’s a bit noisy, at least inside the warehouse, and you feel a stiff breeze when it approaches. The Horsefly is the pride and joy of Workhorse Group, Inc., formerly known as AMP Electric Vehicles. Rucidlo, who serves as president, believes their drone will revolutionize package delivery, especially in rural areas. Right now, it’s experimental but Workhorse, in conjunction with the UC Research Institute, received FAA certification to conduct more extensive testing. Walking through the warehouse, the first thing you notice is a brown UPS delivery truck on a lift—an E-Gen plug-in electric vehicle with an on-board generator. Workhorse cut its teeth on this technology and UPS has purchased 125 of these vehicles to hit the road next year, primarily in the Sun Belt. The company aims to marry the Horsefly with the E-Gen. The Horsefly fits on a platform mounted on the truck roof. The driver plugs in a GPS coordinate, fits the package into the tray, and launches it. The drone rises to roughly 350 feet and then proceeds to its destination, descending on a straight line to a designated drop-off area. Delivery completed, it heads back to the truck. Rucidlo says this approach to package delivery makes a lot more sense than having an armada of drones leaving directly from a warehouse, which seems to be what Amazon is contemplating. “The delivery companies will tell you it’s the last mile that’s the most expensive,” Rucidlo says. In rural areas where residences might be a mile off the main road, UAS delivery can save a tremendous amount of time. “I think we’re on the verge of a Kitty Hawk moment,” he adds. Ernest is one of those recruits. For him, there’s BC (before Cohen) and AD (after drones). “I was an underperforming and timid sophomore when I first met Dr. Cohen,” he says. Today, he’s a CEO of a company blazing a trail in the development of intelligent aerial robotics. “He transformed and inspired me,” Ernest says, “and armed me with the tools and passion to take on the world.” That and an army of drones.